Aurora Cannabis, Canada’s 2nd largest Cannabis company by market cap, reports having sold 1.16 million grams of high-grade marijuana in the final calendar quarter of 2017. They also report having produced 1.2 million grams, out of 2 facilities in Alberta and Quebec, totaling 95,200 square feet. 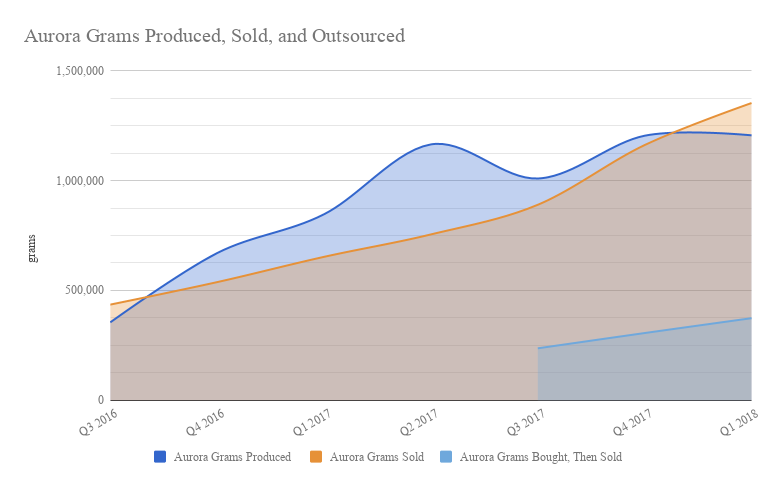 For the past 5 quarters, Aurora Cannabis has been reporting both a “grams sold” and a “grams produced” number in their quarterly MD&As. Aurora is the only Canadian cannabis company that reports this way. Most report only grams sold. On the surface, this seems helpful to investors. It’s a look at how the operations are progressing early-on, independent of sales. But those of us who are interested in the operations health of these companies read the quarterlies closely. 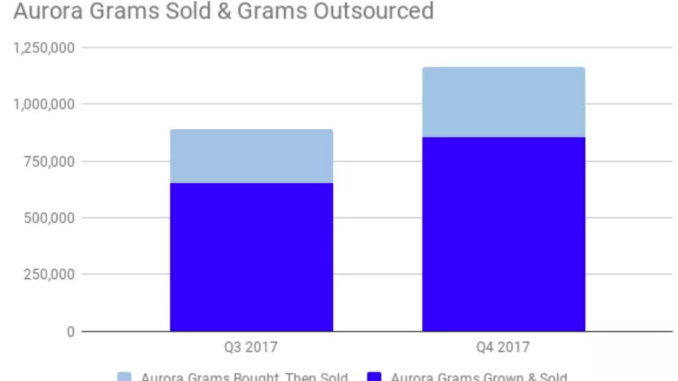 This quarter, Aurora started reporting their cost lines in a way that is a little bit more like their peers, and breaking out their costs on a per-gram basis. In order to get that, they had to report how many of the grams they sold were actually grown in their facilities, and that may not mean a lot to you, but it filled a meaningful hole in our spreadsheet-shaped heart. Canopy, Canada’s largest grower, has a whole lot to report on and generally does a good job of it. A litany of properties are well described, and it’s easy to tell what’s active and what isn’t. They return our calls and when we asked about outsourcing, they told us that their “Craft Grow” line makes use of outsourced pot. It’s sort of a microbrew for stoners patients. The company didn’t break out the total for us, but ballparked it at 5% of grams sold. That’s a reasonable number that’s easy to adjust for. Aphria reports a lot like MedreLeaf, if MedreLeaf had OCD. Everything is itemised. They give several different cost breakdowns, all with lots of line items that make it easy to compare their costs to those of their peers. They won’t deal with the press by phone, but usually promptly reply to emails with high-detail answers. Aphria presents as a company run by a knowledge-focused team, and we’ve got a soft spot for that. Aphria grows all of their own product, always has, and has no plans to sell outsourced product. Poth’s reporting is like: “Whatever. This is fine.” They don’t report any outsourcing, and don’t return our emails that ask them about it. They declined to provide volumes either specifically or as an estimated percentage. Cannimed reported a lot like CannTrust did, never did give us an answer about outsourcing, but with all those square feet it’s a hard thing to imagine. In any case it doesn’t really matter now that they’re a soon-to-be wholly-owned subsidiary, which brings us back to Aurora. If a gram is grown in the forest, and nobody buys it, does it make a buck? When it comes to calculating the tip to tail efficiency of these cannabis operations in relation to each other, we’re only interested in the grams that are grown in the facility, then sold. The grams bought and re-sold only throw us off, and they upset a delicate balance if we can’t control for them, and the gymnastics Aurora is putting us through… well… we’re just not that fit. We knew back in December that Aurora’s sales were partially outsourced. At the time, they told us that they didn’t know how much they bought and re-sold, but this seemed curious. They publish a cost line for product bought from outside… why no volume? 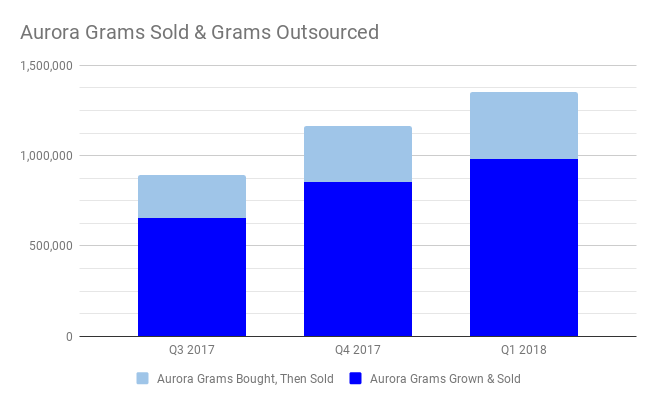 Armed with a way to calculate the volume of their outsourced bud for the past two quarters, courtesy of their Q4 MD&A, we make Aurora’s outsourcing at 35% of total gram sales in volume terms. We’d like to get the previous quarters, but projecting that backwards is sort of a hacky way of doing it. We’ve tried using price to figure it out – working backwards from the cost line – but their cost for outsourced bud ends up being too inconsistent to work with reliably. And in any case, there’s no reason we should have to do this by following breadcrumbs. Eventually, we’re going to have to pick a way to backwards-project their outsourcing for the purposes of comparing operations, but we would really prefer to be able to unpack this. If Aurora is producing a volume of weed greater than their sales… why buy it from other LPs? Here’s all three numbers, the way we have them, with no adjustments or backward projections. 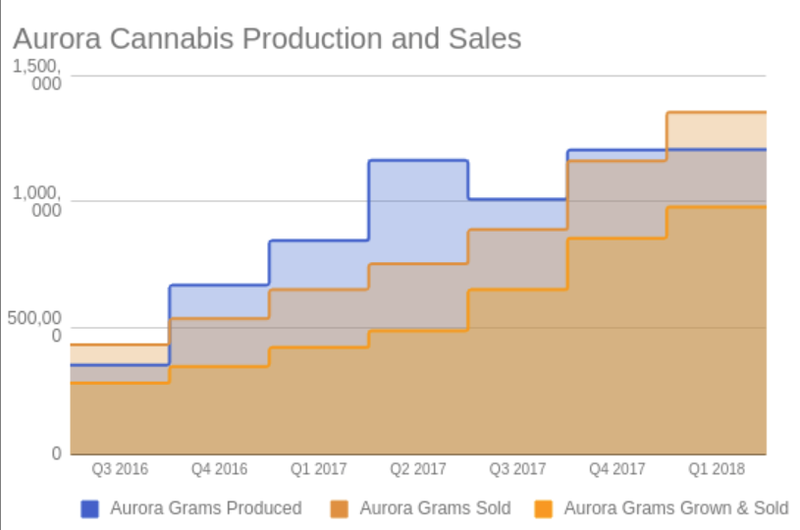 We considered the idea that Aurora might be stockpiling, betting on a price appreciation in the wake of the coming Great Legalization, but that seems like a hell of a risk. In the context of Aurora’s unique “grams produced” figure, one might expect them to also publish an inventory count, like LEAF, but no dice. Besides – the same Q4 2017 MD&A that finally gave up the outsourced grams clearly classifies those outsourced grams as grams that they have sold. When we asked Aurora about outsourcing last year, they couldn’t come up with any real answer. They just kept referring to the “grams produced” line, and insisting that it was what we should use, but that isn’t the way we do it. We emailed them to ask about it again recently, and haven’t yet received a reply. At Fundamental Hype, our analysis uses only “grams sold” totals, because those are the proverbial hatched chickens, and because inter-company comparisons only work with standardized data. Grams sold. That’s what we count. That’s what counts. 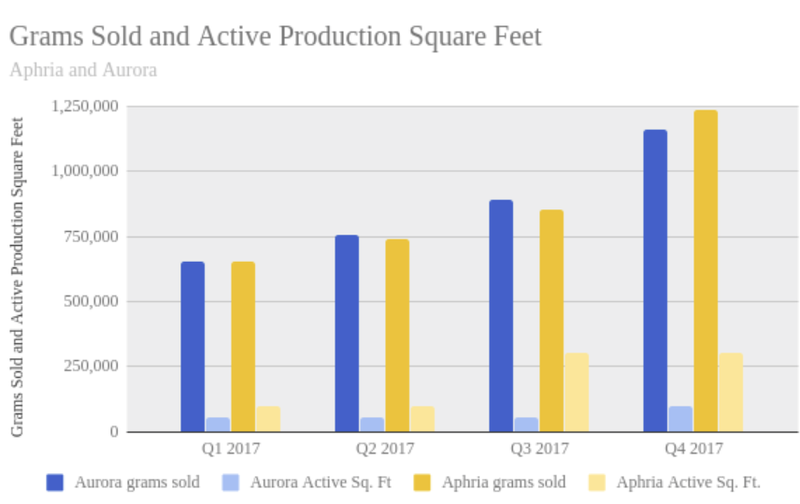 But here we’ve got Aurora Cannabis in a virtual sales tie with Aphria on a third of the production space, and 60% of that space just came active last quarter! While this still doesn’t make a lot of sense to us, it’s nice to finally have some kind of answer on Aurora’s outsourcing. If companies in this industry want the kind of high-level independent analysis that gives investors ideas and confidence, they’re going to have to start reporting like Aphria, MedreLeaf and Canopy.